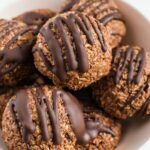 Simple chocolate coconut macaroons that you can whip up in under 30 minutes. The perfect recipe for a Passover or Easter treat. Vegan and gluten-free. Stir together coconut, almond flour, maple syrup, coconut oil, cocoa powder, vanilla and sea salt in a medium sized bowl. Use a Tablespoon or cookie scoop to scoop batter onto a cookie sheet lined with parchment paper. Bake for 20-22 minutes. Remove from oven and let cool — they will firm up as they cool so wait about 15 minutes or so before serving or dipping in chocolate. If adding melted chocolate, add chips to a microwave safe bowl and heat for about 30 seconds and stir. If chips aren’t melted, heat for another 10 seconds or so. If the chocolate seems too thick after melting you can add a teaspoon of melted coconut oil to thin it out. Drizzle chocolate over each macaroon. Place macaroons in the fridge/freezer for 5-10 minutes to allow the chocolate to harden. Store any leftover macaroons in the fridge for later. Be sure to use fine shredded/desiccated coconut. With this type of coconut, the shreds are really tiny and the coconut is more dry. If you use regular shredded coconut (the long strands) the macaroons won’t hold together as well and will spread way too much!